before I needed to help hold it as I piled on the rest of the books! I found a nice selection of non-fiction titles as well as classics. Just play a little music, get out the camera and voila, it gets a little crazy around here! Last week I found a link to some excellent Bible stories mp3 files told in a engaging and simple manner by a grandmother and Sunday school teacher. So far, I have listened to parts of two different selections and have been very impressed with the style and content of the Bible stories. If you have young children or grandchildren, these stories appear to be an excellent rendering: gentle, enjoyable, and above all, faithful to the Bible. We are finishing the last question in our children's catechism book this week after starting over two years ago! Yes, it's an accomplishment that we can enjoy for a little as we work to review and retain that understanding. 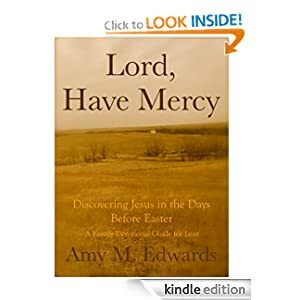 Lord, Have Mercy: Discovering Jesus in the Days Before Easter, a Family Devotional Guide for Lent, and is available as a Kindle download for $2.99. I do not have a Kindle, but Amazon has a free Kindle app which you can download for your computer, which allows you to read any Kindle purchase. Very easy. The study guide is newly released by Amy Edwards and you can read more about the guide at her blog Veritas at Home, as well as see samples on the Amazon link above. I took the time after I downloaded it to read through the entire study guide looking at the various Bible passages and discussion questions and I was very much impressed with the insight Amy has put into this study. I can easily say that the study is suitable for anyone, not just for discipling children. If you sincerely desire to study the Word of God and you would like to be meditating on the importance of the death and resurrection of Jesus long before Good Friday and Easter Sunday, then I urge you to spend three dollars and download the book for your own studies. I cannot imagine you being disappointed with your time or your money. *Updated to add: The book is now available from Amazon as a paperback edition as well! As the sunlight begins to make its full wake up call known, sending sparkling rays across the white snow, I see the snow clouds hovering around threatening to cover the morning light and if the weather forecast is remotely accurate today, we probably will see fresh snow fall. Both the morning sun and the delicate icy crystals swirling down on us are both gifts from the same Creator, King Jesus, who holds all things together. May you praise His name with me for in Him we live and move and have our being. Another delightful story by Miss Read and how this book came into my possession is just as delightful to me, so I'll come back to Miss Quinn in a moment. Several Sundays ago, when everyone was still happy and healthy, we were all in church together sitting in our pew,(yes, the one we always sit in at the back for quick escapes with unhappy or chatty children) and as Niki and her husband Rob walked past us on their way to their pew, she wiggled two slim books out of her bag and gently laid them on my lap, barely slowing her step. I smiled at her and and then as I glanced down to see what they were, I broke into an excited part-whispering, part-squealing, part-gasping explosion of "They're vintage Miss Read books!" Several months back in a phone conversation with Niki's daughter, Vanessa, my friend and Sunday School co-teacher, I mentioned to her that I was excited when I saw her Mom blogging about Miss Read books. And so very thoughtfully, Niki surprised me with two titles from her own library. Thank you again, Niki! And now about the story. Honestly, I did not think I would like the story as much as other Miss Read books, because I found Miss Quinn herself, not the most endearing straight off. But as she finds herself away from home over Christmas, doing tasks away from her usual routines, I think her change of perspective caused me to change mine of her, which may be precisely what Miss Read hoped for from the reader. It is a shorter story than most Miss Read novels and of course that is never a good thing, but shorter stories can be read again and again much quicker than longer ones, even during busy times like Christmas! So I definitely can recommend it to you and again thank you, Niki, for your thoughtful and generous gift. You and Vanessa are both treasures to me. *updated to add a real photo of the books. I love those vintage Penguin orange covers! Several of you wondered why sour cream made the list of must-have ingredients. Now that I feel all self-conscious over needing sour cream in my fridge, I will list all the things I often use it for. And here is a picture of me with my new favorite sweater mentioned yesterday. I took this one myself, sorry to say. Seth took this one with my winter hat that I wear for church and going out in the cold to do errands. I tried on a billion different hats when I was in PA in November and this on by Isotoner was the only one I really liked. I have been working at keeping my wardrobe simple with only items that I really like and will actually wear. I have read a few posts about this topic over the last few months that perhaps I will post about it sometime. About my tea drinking habits, it does sound a bit excessive, but I'll break it down for you. I drink one cup of Lipton, full strength with my breakfast. Since I have been battling this cold, I sometimes have been indulging in a cup of peppermint tea later in the morning. In the afternoon when Seth and I get through our lunchtime and back into our lessons, I drink another cup of Lipton with caffeine to ward off the sleepy eyes. And then in the evening after the girls are in bed, I either have what I consider my dessert tea, (which is something from my Stash collection like Vanilla Chai, Vanilla Hazelnut etc. ), or I have a cup of cocoa. Or again if my throat is sore, I have a Camomile or peppermint tea. Anyways enough about me and my habits, I just wanted to acknowledge all your fun and thoughtful comments to yesterday's confessions. And Jo, I just saw your comment come in before I posted this. It is the end of an era, unless I find one on Ebay to replace my pink argyle. I haven't checked in a while, but I did see some on there awhile back. But I may be over that sweater so it might feel weird to try to replace it. Does anyone else have favorite clothes they can't bear to see wear out or is it just me? (Snapping pics on a sunny winter morning, in our bathroom...clearly this is not a charming and classy photography blog. Please see here and here instead. 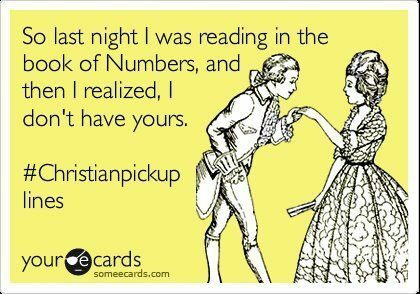 Ha, bet you didn't see that last one coming?! Today, I am finding a little relief from the sore throat and sinus headaches that have bothered me since Saturday morning. My upper jaw even hurt yesterday evening so I was surprised that I didn't feel worse this morning. My sinuses are definitely infected and even though I can feel some pressure today, it is better than the previous days. We'll see how I feel by dinnertime which is often my lowest time. Yesterday brought a visit with my friend Gerda from church and she brought blueberry muffins and those lovely pink tulips to brighten our home. I always enjoy the time together with her and she is so kind to take time from her busy life to share her morning with us. And although my head and throat hurt for most of the day, it was still nice to sit and chat with her as we looked after the kids. We are into February now and the appointments and outings that were cancelled in the last three weeks need to be put back on the schedule. But while I wouldn't say I have cabin-fever, I do feel like the kids need to get out a bit. Seth is registered to start a 6 week Rocks and Minerals course with a local homeschool coop, starting this Friday. This will be his first time doing anything like this so for his sake I hope the experience is a good one and that perhaps we will even net a homeschooling family friend for him that doesn't live too far away. The girls are busier than ever and keep our home full of their playthings faithfully dragged out everyday and littered from one end of the house to the other with cupboards and doors rummaged through in hopes of finding something new and exciting to play with. Lately the kitchen counters have been where all the cool kids hang out. Needless to say, keeping messy and dangerous items out of their reach has become a new futile goal. Kate is providing help in unloading the dishwasher and for the most part it goes well, but there are some times when Mommy just doesn't want any help right now, thank you very much. Despite being laid low in recent weeks with colds and coughs, Seth's schoolwork has managed to keep on track and we are making good progress in many areas. After completing some lessons together on Monday, I went to rest in bed while he completed a list of independent work culminating with a listen to Prince Caspian from Focus on the Family's Radio Theatre. When I came down later in the afternoon, this is how I found him. Kate is doing so well walking, I need to post an updated video very soon so you all can see how well she is progressing. It is very encouraging after all these years of limited mobility to see her walking upright, getting to where she wants to go. Thank you for all your prayers towards this end. Continued prayer is needed for her chewing and eating skills as well as her progressing in her speech. But I praise God for how He has answered our prayers thus far.